What do James Britton, Fisher and Frey, and Vicki Spandel have in common? Let’s review some facts. James Britton (1908­-1994) was an influential British educator and researcher who developed a theory of language and learning that helped guide research about the teaching of writing in school. Fisher and Frey are renowned educators, prolific authors and leaders in the field of language and literacy education. Vicki Spandel is a well-­respected author of numerous books and instructional materials, and was co­-director of the team that developed the 6 Traits model. Hmm. All three have something to do with the components of language; the use of oral and written communication to better understand ourselves and the world around us. Let’s take a closer look. James Britton gifted us with his insights gleaned from years of teaching, researching and refining best practices. In his classic work Language and Learning; he details the role of speech in cognitive development. Language is the means of interacting with people and objects to create experience. His belief that “writing floats on a sea of talk” (Britton, 1970) is particularly useful in language arts instruction. Incorporating talking in the classroom requires time, attention and support. Talking about a topic enables students to rehearse the language they need before writing. It also helps to boost their confidence and build stamina. Douglas Fisher, professor of educational leadership and Nancy Frey, professor of teacher education, collaborate on research, professional books and in­service programs. Their expertise in literacy leadership supports their instructional models of literacy for all. In Content ­Area Conversations, they explore the kind of purposeful talk that leads to the development of academic learning needed for success. Vicki Spandel is a champion for teaching rather than assigning writing. In her books, kits, and seminars, she combines theory and practice to passionately reminding us of the Six Traits of writing. In Creating Writers and in The Nine Rights of Every Writer, she initiates a dynamic conversation in which philosophical reflections lead to practical strategies for fostering growth in writing. Within the body of her life’s work is the belief that writing is thinking. Stimulating thinking through talk and conferring benefits the writer throughout the stages of writing process. Assuredly, additional mentors could be included here to illustrate the common thread: the importance of talk in our classrooms as the foundation for thought and the keystone for literacy learning. A friend and colleague of mine is a Kindergarten teacher in an overcrowded, underfunded urban public school. With the daily demands of curriculum and assessments, and the lack of supports and services, she worries that her students will not have opportunity to reach their full potential. She wants them to know that learning is an ongoing journey with reading, writing and thinking skills providing the passport. While volunteering in her classroom, I saw first-hand how she builds language and communication skills that are so crucial for students’ success in kindergarten and beyond. To stimulate thinking, share stories, and prepare for writing, she uses frequent and varied turn and talk strategies. In a seamless way, these strategies introduce/clarify a topic, open up conversation about rules and routines, and build up a community of learners. 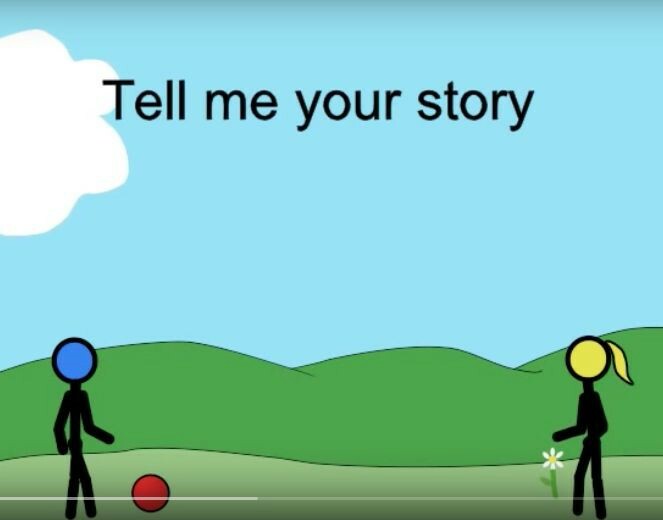 Tell Me Your Story is a song written and published to foster understanding and appreciate differences. The music has a calming effect. In this class, the students participate by having a “toe talk” (sitting on rug and touching toes with a partner) to talk and listen about one of the topics addressed in the song. Students are directed to swivel (spin, twirl, twist) to the person on their left (right, front, back). These quick talks expose the children to several interchanges enabling them to expand their vocabulary and add to their ideas. The topics addressed are very appropriate for writer’s notebook entries: language, name, food, places you have been, things you have seen. After several opportunities to talk, students approach writing with greater effort. On other occasions, students walk and whisper talk on the way to closet, lunch or dismissal. These prompts are intended to raise awareness of surroundings. What did you see/hear on your way to school today? Over time the responses evolve from one-word answers (dog, boy, tree) to more detailed observations (the tree across from school starting to bloom, a boy waiting for the bus). With these speaking and listening activities, young learners start paying more attention to their surroundings and develop curiosity about everyday events. Talking enables students to identify and express a thought before taking on the task of writing. Small group, whole group and one-­on-­one conversations enrich vocabulary and give children opportunities to acquire information from teacher and peers. Through talking, listening, and observing, students better understand the world around them and build up their repertoire of experiences for writing. How do you support “Know Talking” in your classes? Please share in the comments below. Thanks for bringing up this important topic! We often don’t pay enough attention to the role of talk in literacy development. Your post made me think about the kinds of talk that can foster the growth of different types of writing. I’ll explore this more in my classes.